Entertaining season is upon us! Before you know it, you’ll be opening up your home for guests to celebrate Easter, Mother’s Day, graduations, Father’s Day, baby showers, and wedding showers. 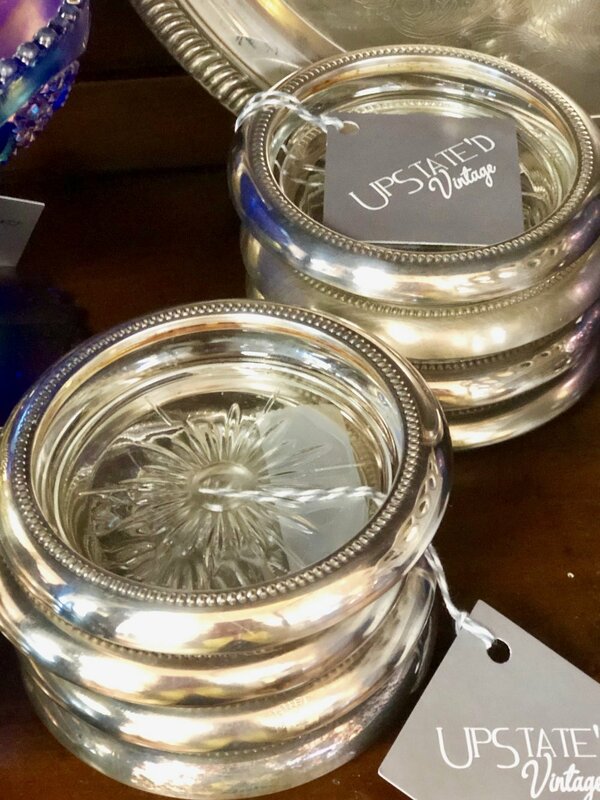 Whether your style is formal dining or casual entertaining, Cottage Grove has everything you need to be the host with the most! Let’s start with dining rooms. Whether you have a separate room in your home or its open to all spaces, this room can occasionally get neglected. Now is the time to finish and complete the decor. You can never have enough dining chairs. 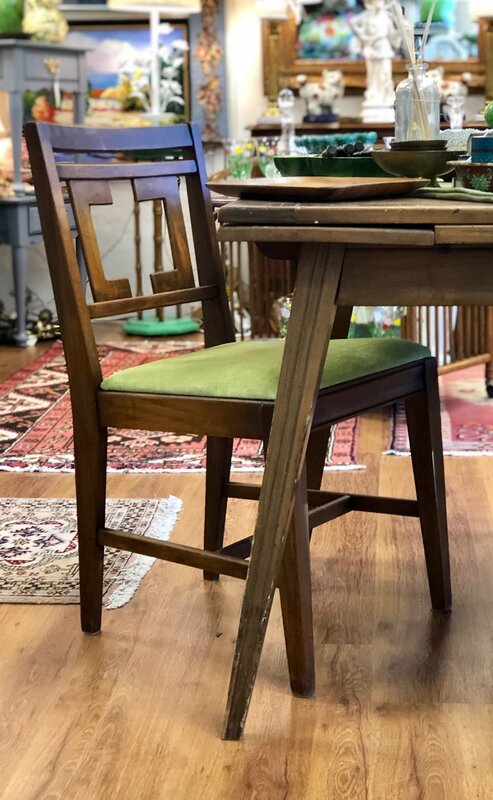 Whether you need a set for your casual family eating space or a formal dining room, having extra chairs is essential to entertaining crowds. 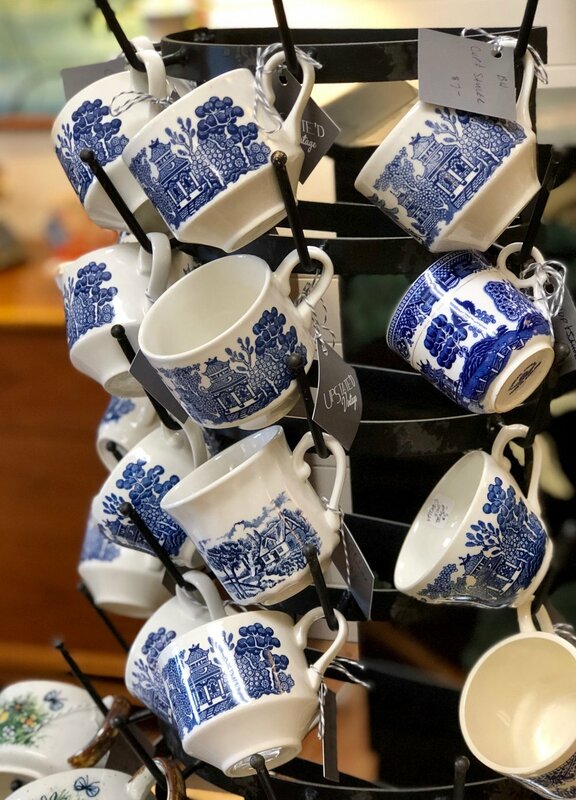 It’s common to pull up those extra chairs on the wall next to your china cabinet; or maybe you wish you had chairs so you could do that! Even if you’re not dining, having a few chairs to pull around for showers and casual get togethers make additional seating easy. A bench can offer the same benefits and break up the monotony of chair after chair. Classic buffalo check with white…and all 4 have arm rests! 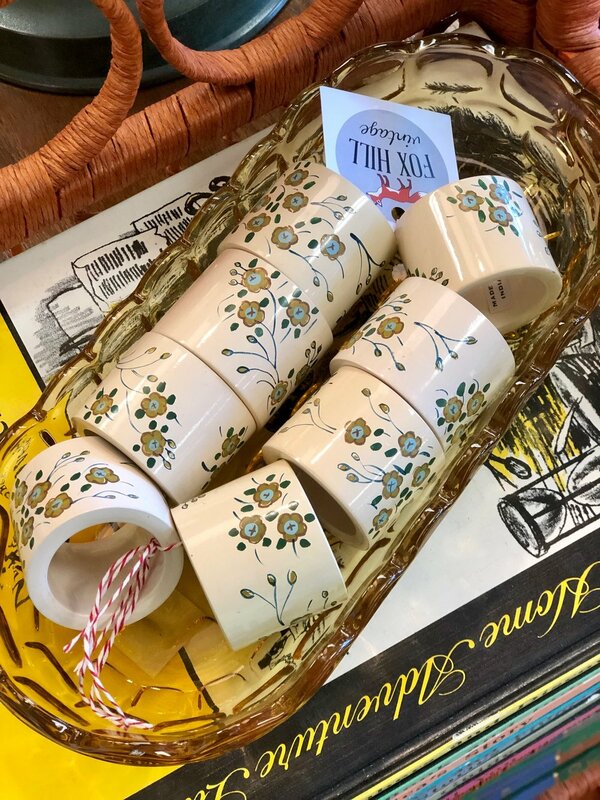 Offered by Cottage Grove Vintage Market. 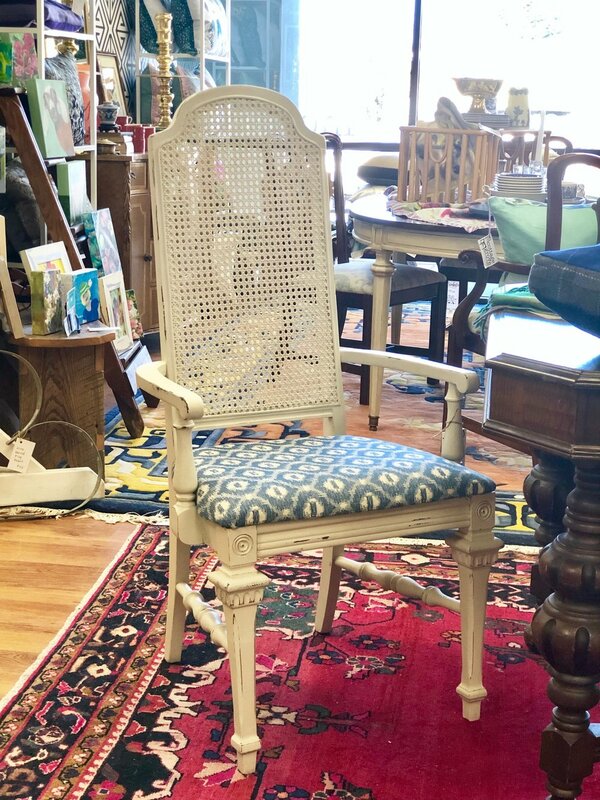 Cane back chairs with blue and white fabric from Cottage Grove Vintage Market. 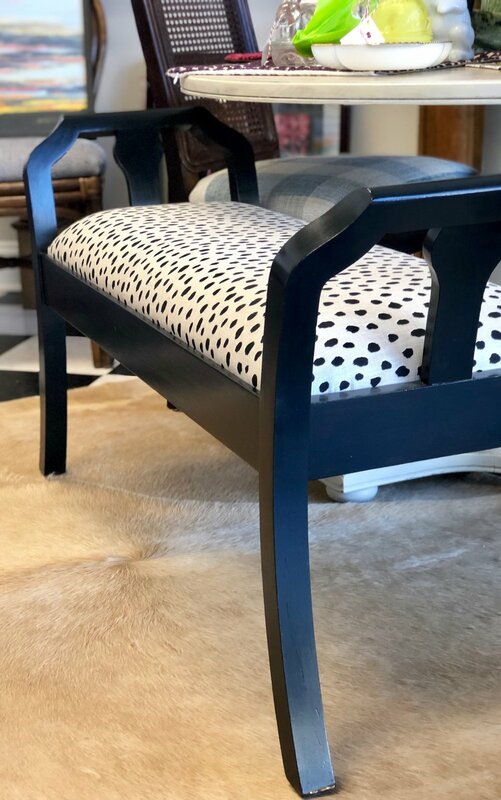 A dotted fabric updates this classic indigo bench. Cottage Grove Vintage Market. 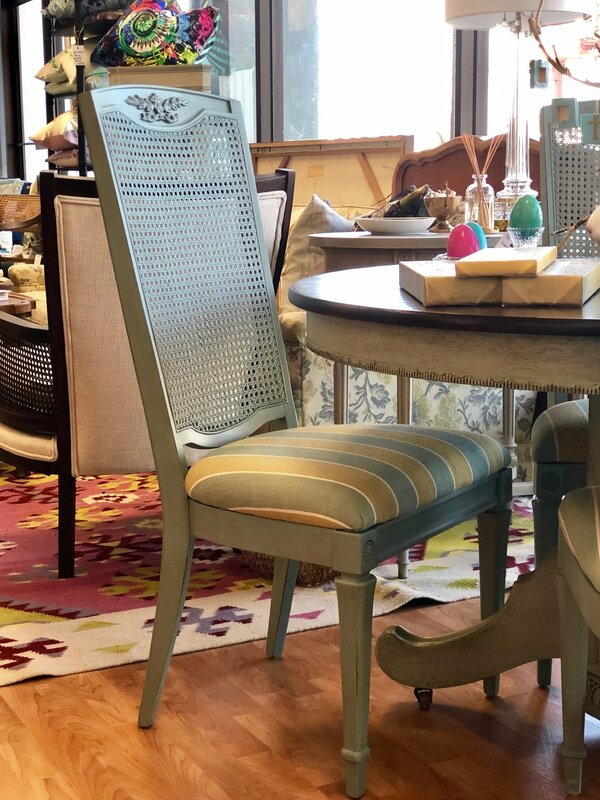 And if you’re in the market for a dining table, many of these chairs have the coordinating table available, too. 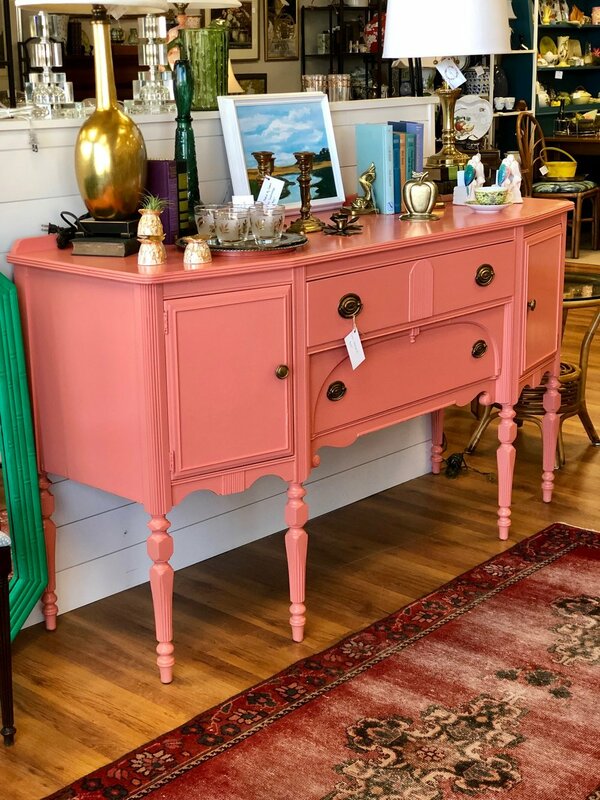 Break up all the wood tones of matching table and chairs with a pop of this coral buffet. 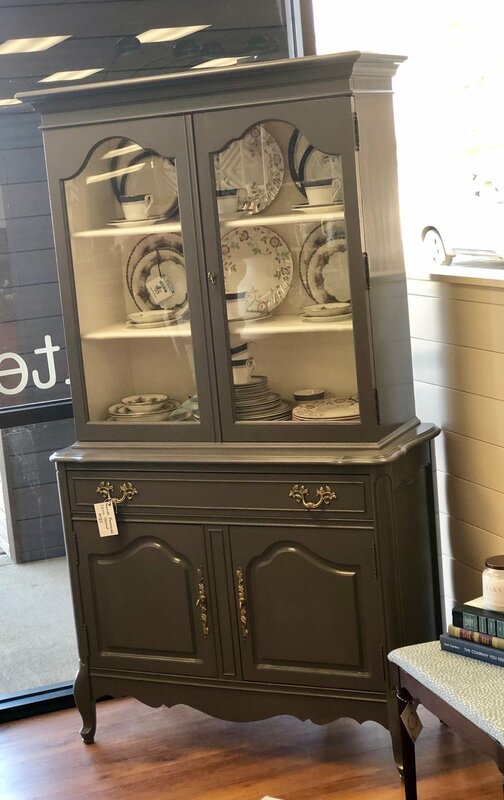 This china cabinet is the perfect petite size for small spaces. Just enough open shelves to display your beautiful plates and functional storage below. Moving right along to the accessories. These smaller items add personality to the party! 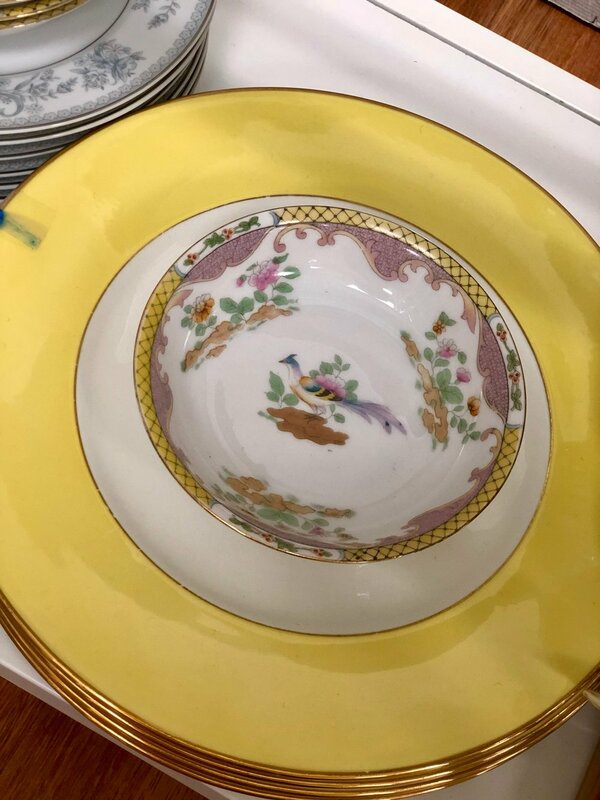 Use your china! Just because something is labeled “formal,” doesn’t mean you can’t use it! Perhaps, you don’t have enough in a particular pattern. 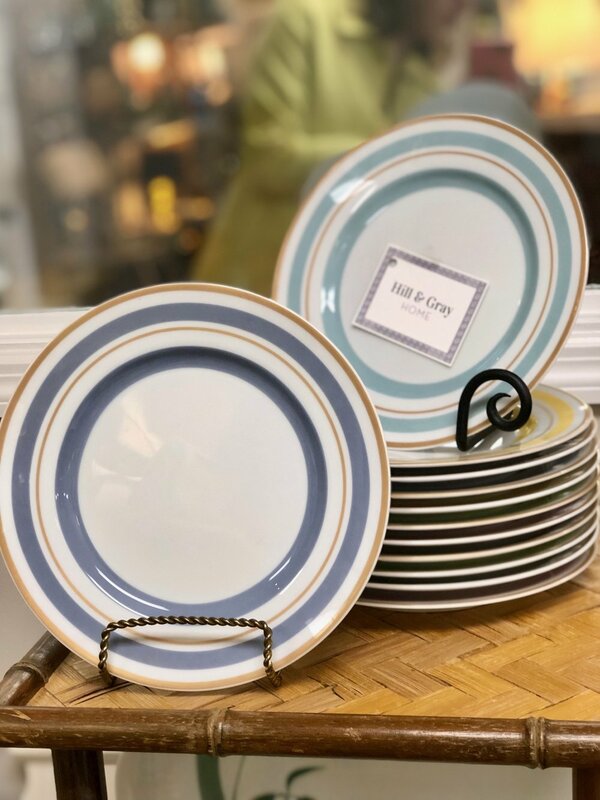 We have an assortment of plates to help you mix and match and coordinate. Why not serve salad or dessert on a different plate? Something fun to add to the mix! Or if you’re casually entertaining, small plates stacked beside a buffet are always helpful! 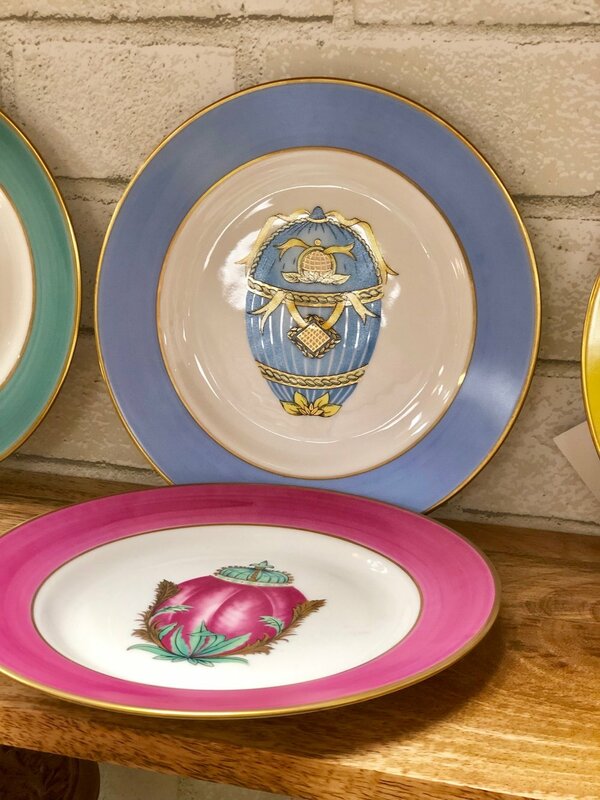 Hip at Grove has a plethora of vintage china to set any table style you could want! Nothing says amateur like disposable, red, plastic cups. And if you’re hosting your grandmother, please, don’t go the one-time-use route. 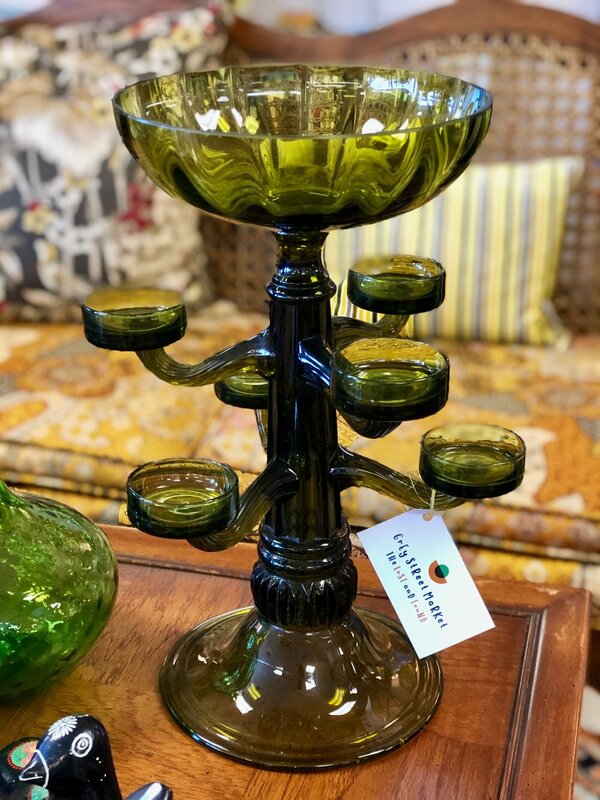 We’ve got any type of glassware you need! 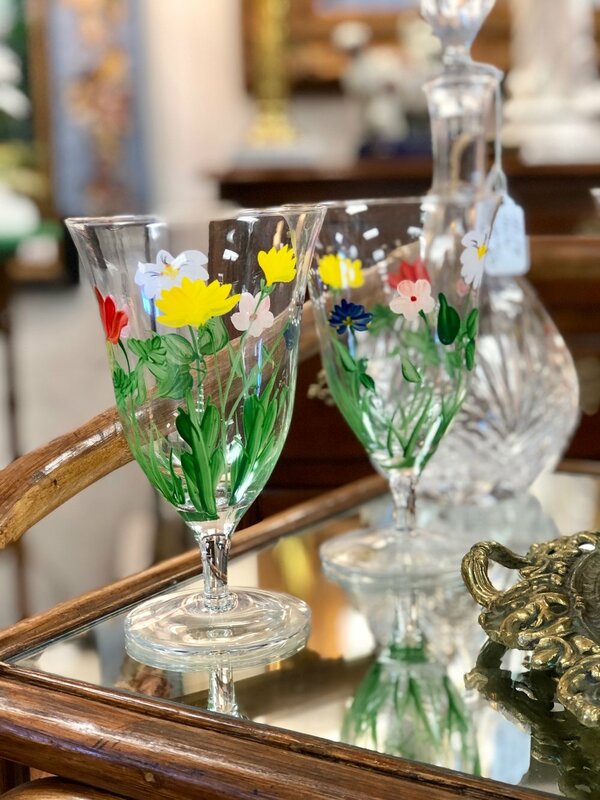 It doesn’t necessarily need to be glamorous, but coordinating glasses take your party to the next level--whether that’s setting a table to match your china or arranging a beverage area for guests to serve themselves. How many times have you had friends bring a dish to share and they forgot the servingware? 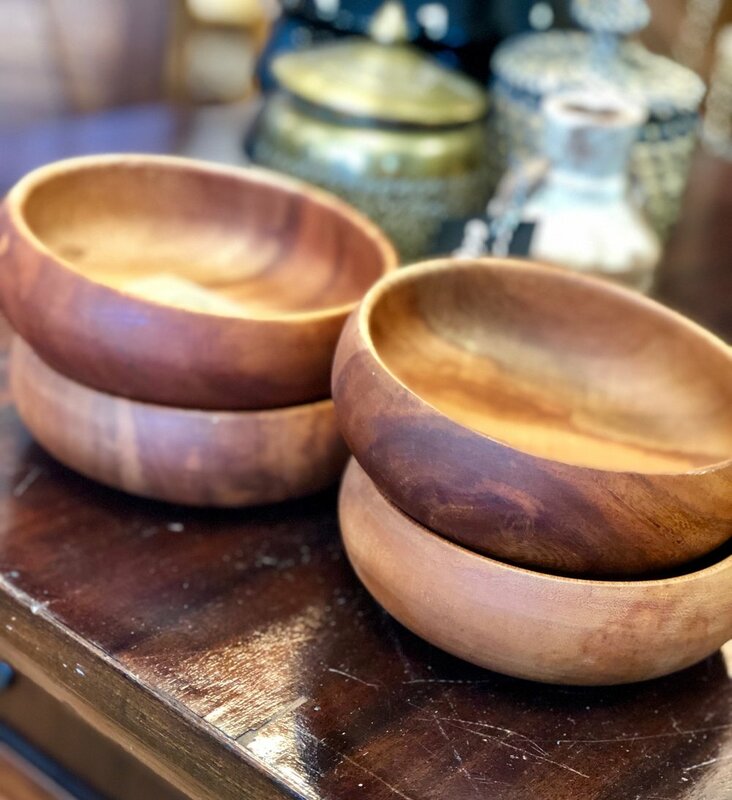 It’s practical to have additional pieces available for such dire times! There’s nothing worse than trying to serve the macaroni and cheese with a basic tablespoon….guests will be grateful for a larger spoon to scoop up a proper helping of everyone’s favorite side dish. Florals are a beautiful touch for table centerpieces or on a buffet, but let’s think outside the box! 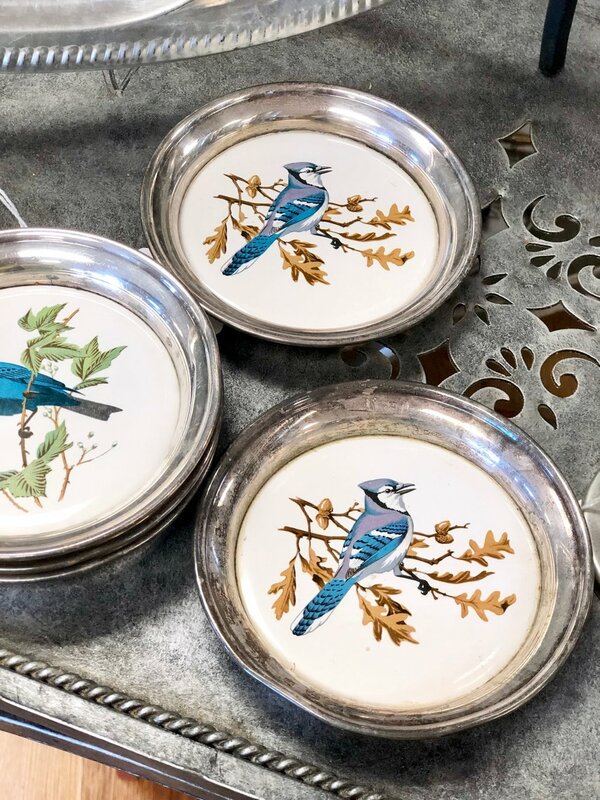 Once you’ve got all the necessities taken care of, the finishing touches of napkin rings, coasters, and salt and pepper shakers will make your table fit for entertaining Martha Stewart--a little extra goes a long way! 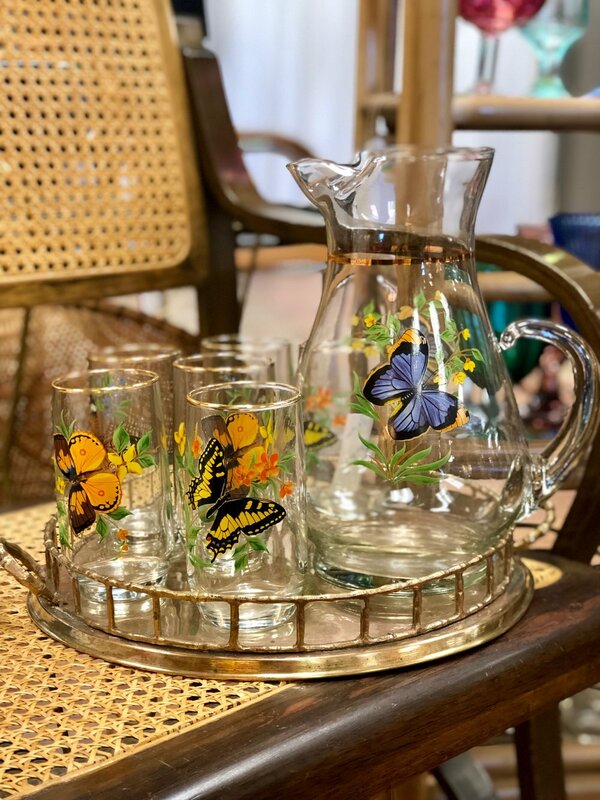 Whether you’re starting from scratch with dining room furniture or need some small items to complete your entertaining aesthetic, Cottage Grove Vintage Market has all the essentials for your hosting demands.